Hasselback potatoes roasted until crisp and topped with a tangy lemon garlic sauce. A flavorful and wholesome side dish bursting with fresh herbs and seasonings. Side dishes are typically not the star of the dinner table, until now! These crispy roasted Hasselback potatoes are tossed in a tangy lemon-garlic dressing for an irresistible addition to any meal. There are two benefits to cutting thin slices into the potatoes. These root vegetables gain a fancier appearance while also making them cook faster. An added bonus of the extra crevices allows the sauce to seep into the spud and infuse more flavor. To round out the recipe, fresh herbs, and seasonings make this side dish a must for your next meal. For a complete meal idea, try these potatoes with a vibrant beet and goat cheese salad or a savory baked honey mustard chicken. What potatoes do you use? Selecting the right potatoes for roasting is essential. For this recipe, I chose spuds that are crisp on the outside but with a creamy center. A mixture of red, white and purple potatoes are selected because they hold their shape well in the high temperature of the oven, revealing the horizontal pattern design on the surface as it cooks. The thin skin allows the centers to burst when bitten into, creating a delightful velvety texture. The potatoes are tossed in extra-virgin olive oil, salt, and pepper, then roasted with fresh sprigs of thyme, rosemary and lemon slices. A foolproof kitchen hack that I learned to prepare these Hasselback potatoes is to use chopsticks when cutting the slits. Positioning the potato between two chopsticks creates a guard so that the knife doesn’t completely cut through the potato. Trust me, I’ve ruined enough potatoes trying to create these beautiful cuts until I used this easy technique! To enhance the flavors of this side dish, I whisked together a delicious lemon garlic sauce using apple cider vinegar. I find that the acidity of this ingredient gives a tasty boost to the sauce. What is in the lemon sauce? When combined with freshly squeezed lemon juice, minced garlic, shallots, thyme, rosemary and olive oil, the raw and unfiltered apple cider vinegar naturally enhances and brightens the herbaceous flavors of the mixture. After the potatoes finish roasting, they receive a generous coat of the zesty sauce right before serving. It’s the perfect compliment to the earthy root vegetables, especially when it oozes into the slits so that the entire potato is filled with flavor, inside and out. Why are waxy potatoes used in this recipe? 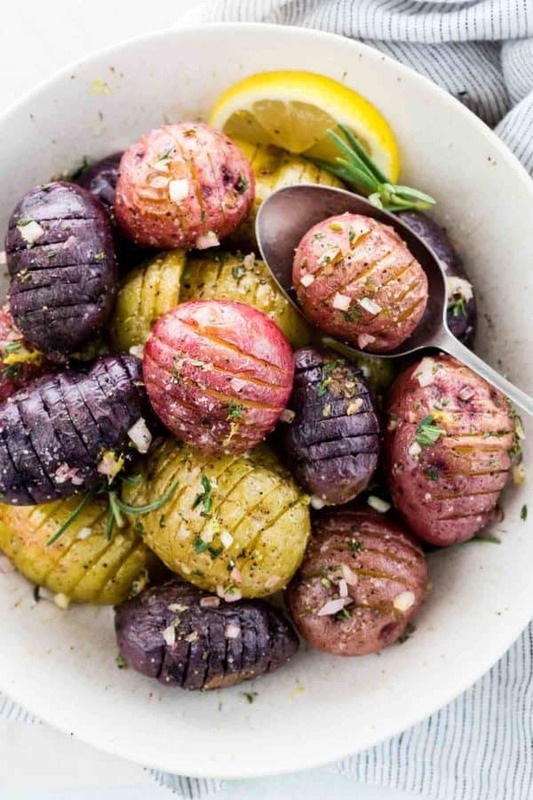 Red, white and purple potatoes were chosen for this recipe because they hold their shape well when roasted in the high oven temperatures, showcasing the Hasselback design. They are a type of waxy potato that has a thin skin on the surface, with flesh that is low in starch yet high in moisture and sugar content. The waxy variety yields a more smooth and creamy texture after baking. 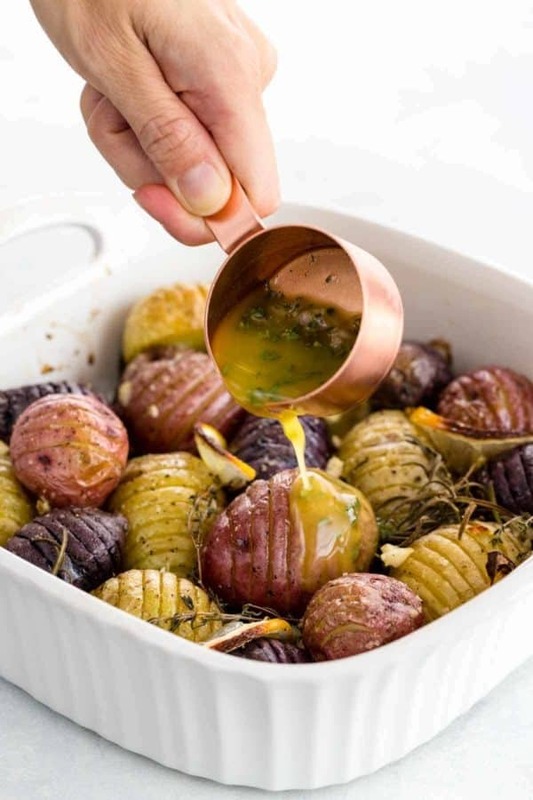 Hasselback potatoes roasted until crisp and topped with a tangy lemon garlic sauce. A flavorful and wholesome side dish bursting with fresh herbs. Use a small knife to make multiple 1/8 inch wide slices in each potato, Make sure not to cut all the way through the potato, leave about 1/4 inch space from the bottom. In a medium-sized bowl combine potatoes, olive oil, garlic, salt, and pepper. In an 8-inch by 8-inch baking dish evenly place the rosemary and thyme sprigs on the bottom of the pan. Place seasoned potatoes on a single layer with the cut side facing up on top of the herbs. Add slices of lemon to the pan. Roast the potatoes until tender and cooked through, about 30 minutes. In a medium-sized bowl whisk together apple cider vinegar, lemon juice, shallots, rosemary, thyme, salt, and pepper. Gradually drizzle in olive oil to the bowl while vigorously whisking to create and thickened sauce. Drizzle lemon garlic sauce onto roasted potatoes or serve on the side. MAKE IT WHOLE30: Use sea salt for kosher salt. I printed the recipe and I am going to make it very soon. Added a few things to my shopping list…shallots and baby reds. I wanted to ask if the Bragg Apple Cider Vinegar will work ok too. I do have the Nature’s Intent Apple Cider Vinegar coupon printed and sent them an e-mail to see if they sell it anywhere in my city. Our neighbor gave us a lot of Meyer Lemons off her tree so I have just begun to utilize them. We made a Lemon Meringue Pie last night. We are going to make lemon poppy seed muffins too. I will check on your cooking app to see if you have a recipe for the muffins. By the way I love your app. Thank you for using the app! Thank you so much Lisa! I hope you can give it a try! Not to sound out of place; I would like to bring to your attention that this delicious recipe is not American, but Swedish. Hasselback potatoes are named after the Hasselbacken Restaurant in Stockholm, Sweden which is credited with being where they were created and first served to the public. My goodness tried it and loved it, so did my family. Thank you very much Jessica.